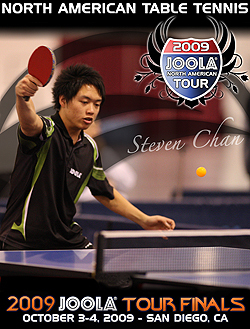 NATT’s Tour Final is the capstone to the season, with beefed-up prize money and one free event entry to every player who won an event category at a 2009 JOOLA North American Tour Stop. This competition brings our season to a spectacular close and there is no place more fitting than San Diego’s Balboa Park Activity Center. October 3rd and 4th are the dates of the competition, an excellent time to enjoy the clement climate of San Diego! Balboa Park Activity Center is a immense roofed space,designed for badminton and table tennis, wooden floors, in a clean and well-maintained stand-alone building. The lighting is excellent and the public couldn’t be more involved, they have table tennis fever in San Diego! To protect the excellence of the facility, no food is allowed in the building. Parking is ‘no problem’, the locals couldn’t be friendlier and the town is one of America’s favorite travel destinations. Plan now to attend and bring your ‘A’ game! We finish off the season in style, celebrate our love of the sport and crown the Tour Champions, this October in San Diego! JOOLA tables, barriers and JOOLA Orange 40mm 3 star balls. For a special rate, please mention the group code table tennis!